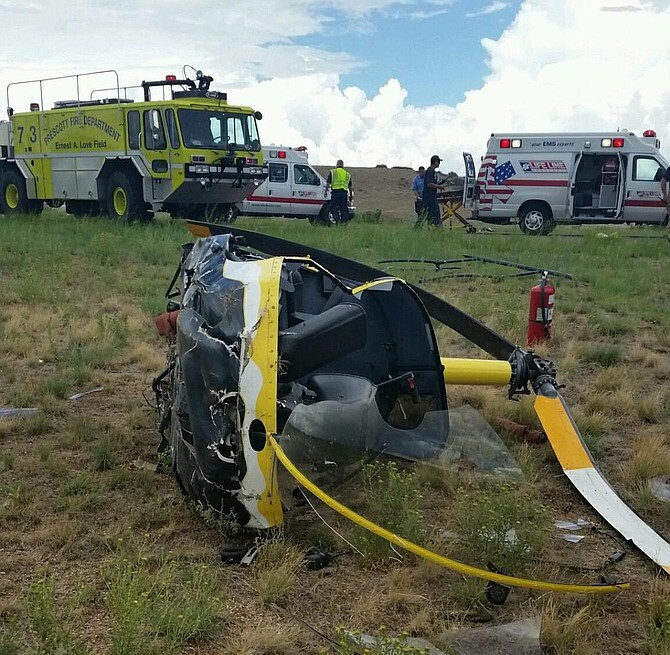 On August 2, 2016, about 1027 mountain standard time (MST), a Robinson R22 helicopter, N22UH, landed hard at Ernest A Love Field Airport, Prescott, Arizona. The certificated flight instructor and student pilot received minor injuries. The helicopter sustained substantial damage to the fuselage and the tail boom. The helicopter was registered to Alba Leasing Services and operated by Universal Helicopters under the provisions of Title 14 Code of Federal Regulations (CFR) Part 91 as an instructional flight. Visual meteorological conditions prevailed, and no flight plan was filed. The local flight departed Prescott, Arizona, about 0950. The student pilot and the flight instructor were practicing straight in autorotations. During the glide, with the student pilot at the controls, about 400 feet above ground level, the flight instructor noticed a fast rate of decent and a decay in rotor RPM. The flight instructor stated to the student that he had the controls and started applying collective and throttle control to recover RPM. The instructor felt the collective go up and stated again to the student that he had the controls. The flight instructor was unable to arrest the decent or recover RPM prior to the hard landing. During touchdown, the landing skids collapsed, the main rotor blades connected with and severed the tail boom. The helicopter came to rest on its left side. The flight instructor reported no pre-impact mechanical malfunctions or failures with the airframe or engine that would have precluded normal operation. On August 2, 2016, about 1035 mountain standard time (MST), a Robinson R22, N22UH, made a hard landing at Ernest A Love Field Airport, Prescott, Arizona. The helicopter was being operated by Universal Helicopters under the provisions of 14 Code of Federal Regulations (CFR) Part 91. The student pilot received minor injuries and the flight instructor (CFI) was seriously injured. The helicopter sustained substantial damage during the accident sequence. The local instructional flight departed Prescott, Arizona, about 1000. Visual meteorological conditions prevailed and no flight plan had been filed. The pre-solo student pilot and the flight instructor were practicing straight in auto-rotations. The flight instructor stated during the descent he noticed the rotor RPM was low and then the student pilot increased the collective pitch which resulted in the rotor RPM to decay further. The helicopter hit the ground hard and the landing skids collapsed, the main rotor blades connected with the tail boom and severed the tail boom. The helicopter came to rest on its left side. The accident site was documented and photographed. The wreckage was recovered for further examination.